This is a powerful story. The author has taken the events of 9/11 and shown us how the events thereafter were just a horrific. Khalid is a fifteen-year-old boy in England. He and his family go to Pakistan to help his aunts find a place to move. His father ventures off to look at a rental and doesn’t return. His mother sends Khalid to the same address to look for his father. He doesn’t find him. On his way back to his aunt’s house he is caught up physically in a demonstration. He manages to make his way back to his aunt’s home. Later that evening men in black break into the house and kidnap him. He is accused of being a terrorist and eventually sent to Guantanamo Bay. His family has no idea at first what has happened to him. The book details his abuse and torture while imprisoned. It seems obvious the author of the book did not like the Bush administration. I can overlook that in this book. 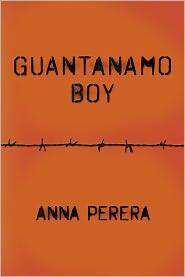 What I could not overlook was the fact that although this book is fiction, we know that young innocent children and teens were abducted and accused of being terrorists and sent to Guantanamo. We also have knowledge of the humiliation, abuse and torture that took place. The author was not afraid to speak out about these atrocities. If we hide things like these from our children then they will repeat our mistakes. This is a bitter pill to swallow. However, I remember my parents telling me about the Japanese-Americans being sent to interment camps here in the United States. We learned nothing. After 9/11 we looked at people of a different nationality and different religion and decided, or judged them based on those two factors. Although I would not recommend this to my sixth graders because of the graphic nature of it, I would recommend it to seventh grade and up. The book has a timeline of events in the back, several sources to check the information and the most wonderful questions. To me the questions were so thought provoking that they could be used not just for this book but for the topic of terrorism and family and many other things. This has been one of the better books I have read this summer. It is not a light read. It stands at over 300 pages and reads quickly, but the topic itself is heavy. I found myself crying often at the injustice. The author definitely has a way with words to say the least.